Burlingame is a popular and prestigious town found in the central western portion of the state of California. Burlingame is situated in San Mateo County along with a number of other suburban residential communities, such as Millbrae and Hillsborough. Burlingame has a population of approximately twenty eight thousand two hundred residents, making it slightly larger than some other similar Bay Area towns. Burlingame is located along the San Francisco Bay, a waterfront area boosting property values for most surrounding communities. Burlingame is located in the immediate proximity of the San Francisco International Airport, meaning that the Burlingame economy is heavily driven by the airline industry, and to a certain extent the tourist industry. Burlingame is currently governed by Mayor Ann Keighran as well as City Manager Jim Nantell. Burlingame covers a total area of about six square miles, including nearly two square miles of standing surface water. Burlingame is a relatively dense community, with a population density of about six thousand five hundred persons per square mile. Burlingame takes its name from Anson Burlingame, a noted diplomat and public figure. Burlingame was originally incorporated in the year nineteen eight, although it was populated much earlier than that by San Francisco residents. Burlingame is relatively diverse in terms of the nation, but is less heterogeneous than the rest of the Bay Area. This is possibly due to the extremely high property values of Burlingame, which averages around one million dollars. The average household income is also remarkably high, exceeding about a hundred thousand dollars per year. Burlingame real estate is subdivided into a number of smaller neighborhoods, including Lyon Hoag, Ray Park, Downtown, Burlingame Terrace, Burlingame Village, Burlingame Gate, Country Club Manor, Easton Addition, Downtown, and Oak Grove. Burlingame was originally settled in the mid nineteenth century, and had a population boom following the San Francisco earthquake. Educational opportunities for residents of Burlingame property are offered by schools including Burlingame High School, five public elementary schools, and nineteen preschools. Burlingame is also home to the Burlingame Library, Saint Catherine of Siena, Mercy Burlingame, and Our Lady of Angels School as well as nearby colleges and universities. 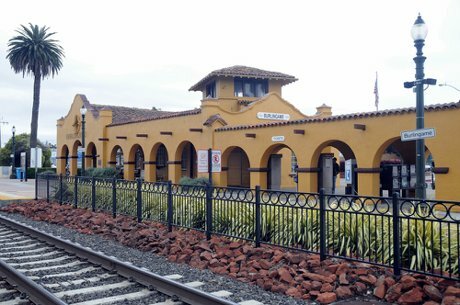 Burlingame train station image from Flickr user Koshi Koshi.